The term 'Highbridge Caravan Centre Ltd' or 'Highbridge' or 'us' or 'we' refers to the owner of the website whose registered office is Highbridge Caravan Centre Ltd, A38 Bristol Road, Highbridge, Somerset, TA9 4EX. Our company registration number is 01953871 (England). The term 'you' refers to the user or viewer of our website. 1. Save as expressly provided in these conditions and the written contract between the parties, and except in the case of Consumer Sales (as defined by the Sales of Goods Act 1979 as amended), or in respect of death or personal injury caused by the Seller's negligence, the Seller shall not be liable to the Purchaser and all warranties, conditions or other terms implied by statute or common law as to the quality of the vehicle or its fitness for purpose are hereby excluded to the fullest extent permitted by law. For the avoidance of doubt the above means that in the case of trade sales the implied terms of satisfactory quality and fitness for purpose are expressly excluded. Where the vehicle is sold under a Consumer Sale, the statutory rights of the Purchaser are not affected by these Conditions. 2. Orders for vehicles, and offers of part exchange allowances for any used vehicle, must be confirmed in writing by the Seller and accepted by the Purchaser, subject in either case to these conditions, which shall govern the Contract. No variation to these Conditions shall be binding unless agreed in writing by the Seller. 3. If the Purchaser cancels the order the Seller may recover his reasonable consequential costs and losses from the Purchaser. Unless specifically detailed in writing on the order, the Purchasers liability on cancellation will not exceed the full value of the deposit. 4. The Purchaser shall take and pay for the vehicle within 14 days of being notified by the Seller that the vehicle is ready for delivery, provided that delivery will not take place before the delivery date specified on the Order form unless an earlier delivery date is agreed. If the Purchaser fails to take and pay for the vehicle in accordance with this condition, the Seller shall be entitled, but not obliged, to cancel the contract, to re-sell the vehicle to a third party, and to recover his reasonable consequential costs and losses from the Purchaser. Unless specifically detailed in writing on the Order form, the Purchasers liability on cancellation will not exceed the full value of the deposit. 5. Risk of damage to or loss of the vehicle shall pass to the Purchaser upon delivery of the vehicle or payment in full for the vehicle, whichever is sooner. 6. Notwithstanding the provisions of Clause 6. The property in the vehicle shall not pass to the Purchaser until the Seller has received full payment for the vehicle, together with delivery of the used vehicle (if any) offered by the Purchaser in part exchange. Where payment is made by cheque or banker's draft full payment will not be deemed to have been made until the cheque/bankers draft has cleared. 7. Until such time as the property in the vehicle passes to the Purchaser, the Seller shall be entitled at any time to require the Purchaser to deliver up the vehicle and if the Purchaser fails to do so forthwith, to enter upon any premises of the Purchaser or any third party (whether the Purchaser is in administration/ receivership or not) where the vehicle is stored and repossess it. 8. a. Any accessories fitted as new to the vehicle will be entitled to the benefit of any warranty given by the manufacturers of those accessories. b. Unless specifically requested by the Purchaser, accessories supplied may not be the products of the manufacturer of the vehicle purchased. 9. Any estimated date quoted for delivery of the vehicle is approximate only and the Seller shall not be liable for any loss suffered by the Purchaser arising from any delay in delivery of the vehicle, howsoever caused, provided that if the Seller fails to deliver the vehicle within 21 days of the estimated date of delivery, and an alternative delivery date cannot be agreed, the Purchaser may cancel the contract and any deposit paid by the Purchaser shall be refunded in full. or ii. That such vehicle is subject of a hire purchase or other encumbrance or encumbrances capable of discharge by the Seller, in which case the allowance shall be reduced by the amount required to be paid by the Seller in discharge of the encumbrance or encumbrances. b. Fair wear and tear accepted, the Purchaser shall deliver the used vehicle to the Seller in the same condition as at the Seller's examination of it or acceptance of it prior to confirmation and acceptance of this order. c. Such used vehicle shall be delivered to the Seller within 14 days of written notification to the Purchaser that the vehicle is ready for delivery and upon delivery property and risk in the said used vehicle shall pass to the Seller. d. If through no fault on the part of the Seller the vehicle shall not be delivered to the Purchaser within 30 days from the date of order or the estimated delivery date, the allowance granted by the Seller on the said used vehicle shall be reduced by an amount of 2.5% for each complete period of 30 days from the date mentioned above until the delivery of the vehicle. 11. Failure by the Purchaser to comply with the foregoing Conditions (other than 11.d.) entitles the Seller to be discharged from its obligation to accept the used vehicle or make any allowance in respect thereof, and the Purchaser shall discharge in cash the full price of the vehicle to be supplied by the Seller. 12. Notwithstanding the provisions of this Agreement the Purchaser may before the expiry of 7 days following receipt by him of notification that the vehicle is ready for delivery, arrange for a finance company to purchase the vehicle from the Seller at the price payable hereunder. Any used vehicle for which an allowance was agreed to be made to the Purchaser pursuant and subject to Clause 10, shall be bought by the Seller at a price equal to such allowance and the Seller shall account to the finance company on behalf of the Purchaser for the price and any deposit paid by him under this agreement. b. Notwithstanding the sum for Car Tax and Value Added Tax specified in the order, the sum payable by the Purchaser in respect thereof shall be such sum as the Seller has legally to pay at the date of delivery. d. In the event of the Manufacturer of the vehicle described in the order ceasing to make vehicles of that type or specification then (whether the estimated delivery date has passed or not) the Seller may, at any time, by notice in writing to the Purchaser, cancel this Agreement and refund any deposit paid in full. The Seller will not be liable for any consequential losses incurred by the Purchaser. 14. The Purchaser must provide the Seller with any information it needs in order to comply with money laundering legislation, and guarantee the accuracy of the information so supplied. 15. The Purchaser warrants that it is not intended to resell the vehicle for commercial purposes. If the Seller discovers before delivery that this warranty is untrue, they may give the Purchaser notice cancelling the Agreement. 16. Except where the Purchaser is buying as a consumer, and except for fraud or for death or personal injury resulting from the Seller's own negligence, the Seller limits its liability for any breach of this Agreement to the amount of the Purchase Price and expressly excludes all liability for loss of profit, goodwill or contracts and for any indirect, consequential or economic loss. 17. Any notice given under this Agreement must be in writing and sent by recorded delivery to the address of the person to whom it is addressed as set out overleaf, and shall be deemed to have been received when recorded as being delivered. 18. These terms and conditions do not affect and cannot exclude any of your statutory rights as a consumer. For more information on these statutory rights contact a local authority Trading Standards Department or Citizens Advice Bureau. If you have any concern about our products or services please get in touch with us and we will be happy to help in any way we can. 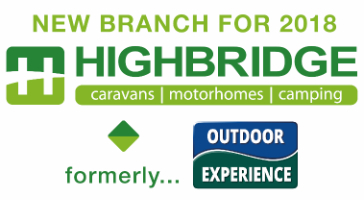 Highbridge Caravan Centre Ltd is a member of the NCC Approved Tourer and Motorhome Sales schemes. A key commitment under the Code that lies at the heart of the schemes is that we maintain a clear and formal written complaints procedure and take effective and immediate action to try and resolve any customer complaint. We will acknowledge your complaint, in writing or by phone, within 2 working days of receipt. We will issue an initial response or a final decision, in writing, as soon as possible or at the latest within 10 working days of the date of your complaint. If we issue an initial response and you notify us that it does not resolve your complaint, we will issue a final decision, in writing, as soon as possible or at the latest within a further 5 working days. In all instances, if we legitimately need more time to investigate and manage your complaint (because it involves another party, etc), we will provide written reasons why and an estimate of the date when we expect to be able to issue an initial response or final decision. We will keep a complaints log which will be available for inspection by NCC assessors. We will keep you informed either by letter or e-mail, whichever you prefer. For all complaints we will provide either a response and/or a final decision in writing. Any final decision will include details of the NCC Informal Dispute Resolution Service and the Independent Case Examiner (the Examiner) in case you require independent redress. Please note that the Examiner will only consider complaints that have been first sent to, and considered by, the NCC Informal Dispute Resolution Service. If you are not satisfied with our final decision, or if we exceed the response timescales (see 1 above), you should then refer your complaint to the NCC for informal dispute resolution. If this fails to resolve your complaint or if the NCC Informal Dispute Resolution Service is not able to handle your complaint, the NCC will escalate your complaint to the Examiner. We will co-operate fully with the Examiner during an investigation and comply with his final decision which is binding on us both. Please note an administration fee of £60 (including VAT) will be charged by the NCC should you wish to use the Examiner service. This fee is refundable only if the Examiner finds in your favour, subject to his discretion. There are no other charges to you for using the service. We will liaise, at your request, with anyone acting formally on your behalf (e.g. Trading Standards, Citizens Advice Bureau, Consumer Advice Centre, etc.). Complaints should be sent to: Mr Darren Squires, Customer Care Manager, Highbridge Caravan Centre Ltd, A38 Bristol Road, Highbridge TA9 4EX. Tel. 01278 782725. Fax: 01278 764810. E-mail: ds2@highbridgecaravans.co.uk. Web: www.highbridgecaravans.co.uk. Note: The National Caravan Council (NCC) is the UK trade body for the tourer, motorhome, holiday home and park home industries. It has developed a number of NCC Approved schemes, each with a Code of Practice at its heart, to ensure that subscriber members treat customers fairly, deliver high levels of customer satisfaction and provide full protection and access to redress should this be needed. Further details can be found via www.approveddealerships.co.uk/tourer and www.approveddealerships.co.uk/motorhomes/. The information contained in this website is for general information purposes only. The information is provided by Highbridge Caravan Centre Limited and while we endeavour to keep the information up to date and correct, we make no representations or warranties of any kind, express or implied, about the completeness, accuracy, reliability, suitability or availability with respect to the website or the information, products, services, or related graphics contained on the website for any purpose. Any reliance you place on such information is therefore strictly at your own risk. Through this website you are able to link to other websites which are not under the control of Highbridge Caravan Centre Limited. We have no control over the nature, content and availability of those sites. The inclusion of any links does not necessarily imply a recommendation or endorse the views expressed within them. Every effort is made to keep the website up and running smoothly. However, Highbridge Caravan Centre Limited takes no responsibility for, and will not be liable for, the website being temporarily unavailable due to technical issues beyond our control.